Today, the National Transport Authority of Ireland launched the planning process that will lead to a redesign of the bus network in Dublin. We are incredibly honored and excited to be their lead consultant on this effort. I explain the planning issues (for a Dublin audience) here. Fare and ticketing improvements, for faster boarding/alighting and to ensure that the fare system does not discourage changing buses. Projects to improve bus speed and reliability throughout the city. Dublin has less rail transit than most European cities of its size. There is no subway, two surface light rail lines, and one corridor along the coast where commuter rail runs every 15 minutes. 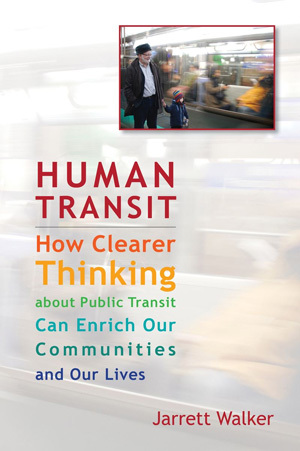 So most of the city is on buses, and the buses must succeed for the city to succeed. First, all frequent lines run into the City Centre, so trips between suburbs out can be difficult. Orbital routes exist but they are not frequent enough for the connections on which most orbital travel relies. This becomes a bigger issue as suburban employment centers – some of them well suited to public transport – emerge. Second, the system is very complex. We drew what may be the first really clear map (link coming soon) of the entire network, but we put a grey box over the City Centre, where a clear map may be literally impossible. Here is the best version available. You see the problem. 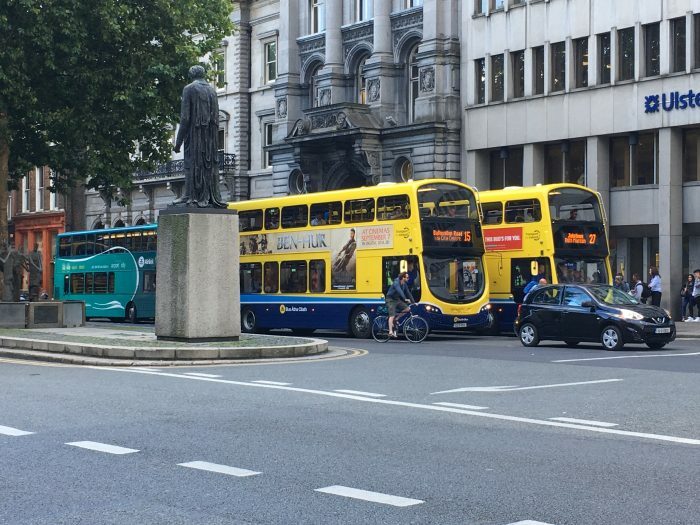 As a result, we think Dublin may be missing opportunities to encourage patronage within the greater City Centre – especially for spontaneous trips and tourism — because while buses are everywhere, it is simply too hard to figure out how to use them. As consultants we can attest to this, because our work requires learning bus systems very quickly. Finally, the City Centre has so many buses running through it that buses are frequently obstructing each other. This problem has many solutions, including bus priority and ticketing improvements that parallel tracks are addressing. But we might be able to reduce these numbers a bit, especially with better orbital service that reduces the need to go through the city if you are not going there. But as it turns out, the key to all of these problems is one question: Can we ask people to change buses if this means they can reach their destinations sooner, and reach other destinations citywide more quickly? (I explained that math here.) This is a hard question, because whatever we do to make it easier, changing buses is still an inconvenience. So we’re asking the public what they think. For the next month, we’ll be accepting input through a web survey, which you can find here, along with our Choices Report that you can download. There, we share some specific possibilities, and ask the people of Dublin about their priorities. As usual we ask: Given how the math works, and the choices it presents, what should we do? 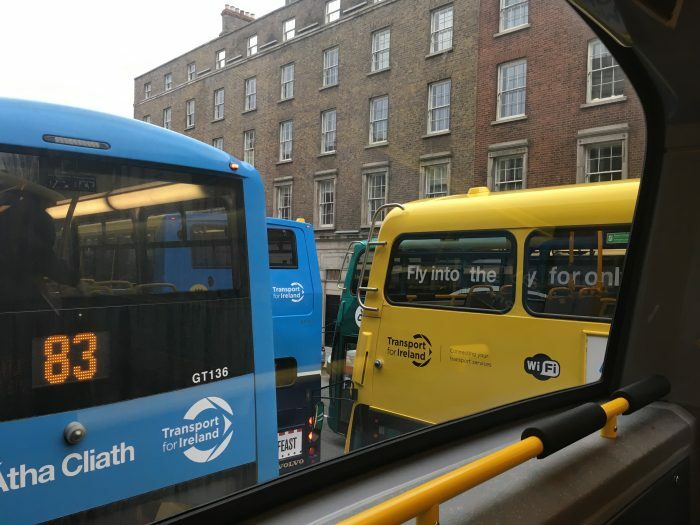 I was impressed with Dublin because they seem to give a lot of priority to buses where they can (especially on the suburban approaches to the city) and the network seemed very frequent but that also made it easy to see the bus congestion. I wonder what the effects of the pedestrianization of the College Green. That was such a steady stream of buses and other vehicles that I wonder how routes will change (the LUAS extension across the Liffey will help though). First of all, the fact that to get from anywhere to anywhere in Dublin you have to go via “An Lár” (the City Centre) has been a wry joke for decades. However, what is always going to hold Dublin back is the very fact that it is “BusConnects” and not “DublinConnects” – i.e. DART heavy rail, LUAS light rail and DublinBus will continue to uneasy bedfellows within the Dublin transport network. This is of course a political problem rather than one consultants can solve. When DublinBus runs orbital routes not just for their own radial connections but LUAS and DART too, maybe progress will really be made, and the case more easily made to build more light rail like LUAS line F1 to Lucan, to stiffen Dublin’s transportation spine off which connecting services can then run. I disagree that there’s any conflict between the planning of different transit modes in Dublin. BusConnects is of course working with the reality of the DART and LUAS lines, which are both key elements of the high frequency network. 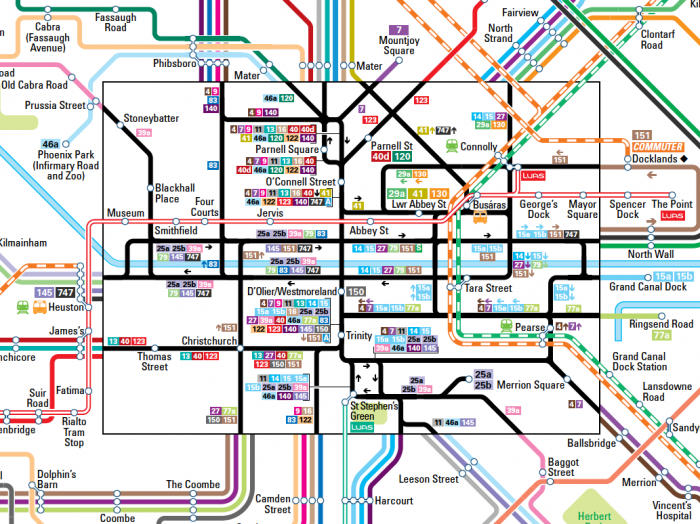 The DART lines are very logical and the LUAS lines mostly so, once the LUAS Green is extended across the city centre. The key thing is that we’re planning for 2018, and at that timeframe we’re not assuming any future rail lines. They’re in the Dublin Transport Strategy for the 2020s, though. I have frequently railed against poor coordination between the planning for different transit modes, but I don’t see that in Dublin at all, at least not in how our project is being framed. Just a small point of fact: there is only one DART line (admittedly with a bifurcation for Howth/Malahide). Neither the Kildare nor Maynooth lines are up to DART standard, which is deeply regrettable as they could (and should) form part of the rapid transit spine of the city (especially the Maynooth line). Essentially they require electrification and corresponding rolling-stock. Dozens of routes run along it, ranging from the core transitway routes that operate at 2- to 5-minute headways, to suburban express routes that might run every 15 or 30 minutes. Overall there’s around 180 buses an hour that run along it during the afternoon rush hour. They make it work, on paper, by running in platoons of 3 buses every traffic signal cycle, with a 60-second cycle length (60 cycles per hour). All 3 buses will stop on the near side of a signal, load while the signal is red, then will leave once the signal goes green. If it works like clockwork, then there is enough capacity. The problem is that it is a challenge to run like clockwork — all 3 buses have to clear the light, every time, or a backup begins to build. Everyone wanting one of the non-“core”, less frequent buses has to watch carefully, as there are no dedicated spaces, and sometimes the rear bus of the platoon has to stop again at the front to pick up a passenger that missed it at the back. The other challenge, I am guessing, is that there are different levels of loading between the different routes serving the transitway — some are overcrowded with associated impacts on loading and unloading times, and others are more lightly loaded. Presumably the situation in Dublin is not to this extreme, but the principle may still be applicable. Yes indeed. Not even the office of the transit authority in the city center had a map which showed in which side street the bus stop of a bus with a particular destination was located. No map to hand out, not even a map on a wall. Inside the public office of the people responsible for the whole system…of course there wasn’t a map of the “system” anywhere either. No pamphlet, no map on a wall, or gasp (!) at the bus stop.